I´ve found a new Italian Crime writer in Giorgio Faletti. 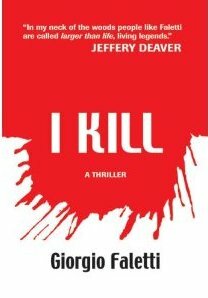 I read his I kill from 2002 and was pleasantly surprised. The book is set in the luxurious Monaco. One night a very popular radio show gets a disturbing phone call while broadcasting live. The person ends with the words “I kill…” The next day a famous Formel 1 racer and chess player is found brutally murdered. In Monaco crime ratings are extremely low and murder just never happens. The Police inspector Nicolas Hulot takes help from his friend the FBI-agent Frank Ottobre who is recovering from traumatic experiences. We´ve seen his sort before. The traumatized, depressed, almost supernatural women magnet. The murderer and his motives are also a bit cliche. This is a book more about two intelligent men who are set against each other then exiting new characters. Even though the main characters are stereotypes there are some nice descriptions of less important characters. There is a nice portrait of a mentally disabled boy and his mother and an old man with a big record collection. The descriptions of the locations are also wonderful. You can feel the breeze from the mediterranean sea, imagine all the yachts in the harbour and all the glittering people at the casino while reading this book. This is a thrilling book with just perfect tempo. Just as things were set on repeat things started happening. The authors also gives one or two surprises. I can recommend this book to all who likes psycopath killers, gruesome murders and an exotic milieu. The book has sold over 3.5 million examples in Italy alone and will be filmed.